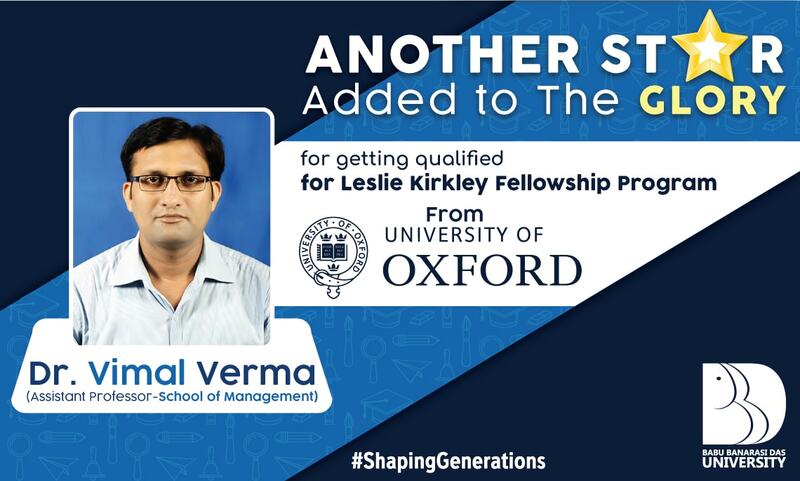 School of Management, BBD University is honored as one of its faculty members; Dr. Vimal Verma has qualified for Leslie Kirkley fellowship from the Oxford Institute of Population Ageing, University of Oxford, UK. The fellowship is granted every year to two emerging researchers. Dr. Verma is an Assistant Professor in the marketing area at SOM, BBD University with over 10 years of experience in teaching. He has contributed significantly to the field of research with some strong scientific publications to his credit. His research explored the factors determining the latent needs, behaviors and satisfaction of ageing consumers. Prof. Verma has shown keen interest in the Institute’s research network in Asia APPRA and we hope that his visit to the Oxford University will provide benefit to all.